SEOUL, South Korea — North Korean leader Kim Jong Un was hosting a dinner with South Korean envoys in Pyongyang on Monday — the first such meeting since he took power in 2011. A spokesperson for South Korea’s presidential office, the Blue House, said Kim was scheduled to meet with the delegation from Seoul beginning at 6 p.m. local time (4 a.m. ET). South Korean President Moon Jae-in sent his chief of national security, Chung Eui-yong, as well as Suh Hoon, the director of the National Intelligence Service, to Pyongyang. Before leaving Seoul, Chung said officials from both sides would discuss restarting dialogue between the neighbors as well as between Pyongyang and Washington. Kim last month sent high-level delegations to PyeongChang for the opening and closing ceremonies of the Winter Olympics. Kim Jong Un’s sister, Kim Yo Jong, become the first member of the ruling Kim family to visit the South since the end of the Korean War in 1953. She sat one row behind Vice President Mike Pence during the opening ceremony, but they didn’t speak. The White House has suggested that it’s ready to talk with North Korea. 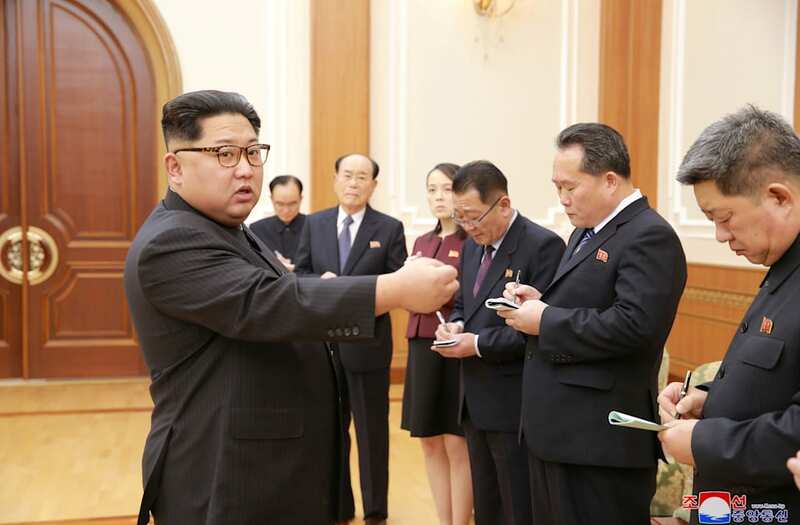 Pyongyang responded over the weekend by saying that it’s interested in discussing issues of “mutual concern” with the U.S. but added that preconditions are a non-starter. Chung's trip is the first known high-level visit by South Korean officials to the North in about a decade. Before leaving for Pyongyang, Chung said he will relay to North Korea Moon's hopes for North Korean nuclear disarmament and a permanant peace on the Korean Peninsula. The South Korean delegation will leave Pyongyang Tuesday and head to Washington to debrief U.S. officials on the talks. Moon is pushing for a summit during his first year in office, but the current thaw spurred on by his self-proclaimed “Peace Olympics” could be shortlived. South Korea and the U.S. still plan to hold annual military drills they agreed to delay during the Olympics. In the past, North Korea has responded angrily to the joint drills, which it claims are preparations for an invasion. Another missile or nuclear test by Kim's regime could quickly derail the current talks and Moon's hopes for a summit. Duyeon Kim, a visiting senior research fellow at the Korean Peninsula Future Forum, said there’s a very small window for the South to broker Washington-Pyongyang talks, assuming it's possible for that to "happen at all." North Korea has not carried out any weapons tests since late November, when it fired its largest intercontinental ballistic missile.